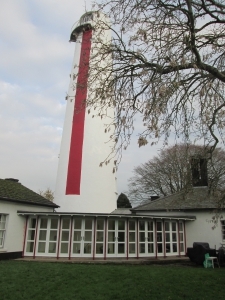 I was called by the owner too look at a very interesting project and come up with a realistic solution to his very specific requirements regarding a glazed wall surrounding a lighthouse. The original doors were c1960s softwood and single glazed. The rear wall of the room and the roof had no insulation. The original doors had been looked after over the years however were very cold, draughty and suffering from varying degrees of rot primarily to the lower rails, the lower sections of the vertical timbers and external sill. Barrie is attempting to update this historically important and imposing building retaining as much of the original character of the building as possible. 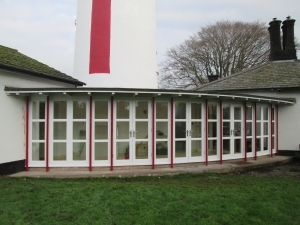 Barrie asked us to look at the possibility of restoring, weather proofing and double glazing the existing doors or replacement however the overall appearance of the doors had to be retained. 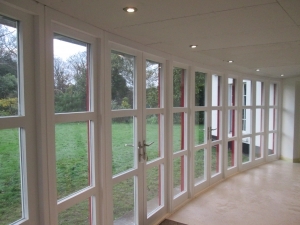 The doors which form a glass wall had to be thermally efficient, meeting modern glazing requirements with the additional security provided by a high security multi point locking systems. When the costs of restoration which would require substantial alteration and replacement were compared the costs were similar but the existing doors could not be as durable over the long term. The doors to be hand finished to mimic the original finish using a micro porous paint system. The doors were completed in the time scales required. This is an example of our willingness to look at providing a bespoke solution to a very specific problem. The customers very specific requirements were met.